Trenches and jackhammers could be coming to Rosecrans Street by year’s end to relocate several miles of an aging Navy fuel line, according to the commanding officer of Naval Base Point Loma (NBPL). It’s a two-year project to replace the first five miles of a 17.3-mile pipeline that carries diesel and jet fuel from Point Loma to Miramar, said Capt. Howard Warner, who assumed command for a three-year term last August. Warner earlier this month addressed two local groups — the Peninsula Community Planning Board and Midway Community Planning Group — in an attempt to assure citizens that the $26 million project will cause inconvenience but won’t prevent residents and businesses from using the Peninsula’s most congested and well-traveled artery. Warner, who commanded or served on five nuclear submarines before accepting the top post at NBPL, is in the midst of an information offensive to get the word out. His high-profile campaign continues next month, when he visits planning boards in Old Town and Linda Vista. “I’m here for the next three years. I’m going to be your neighbor to the south. I think it’s important for the community to know what we do and who we are,” Warner said. The plan calls for new pipe to be installed from the PLNB’s 10-tank farm and run north along Rosecrans to Talbot Street, where it will turn west and go up Scott Street for several blocks. 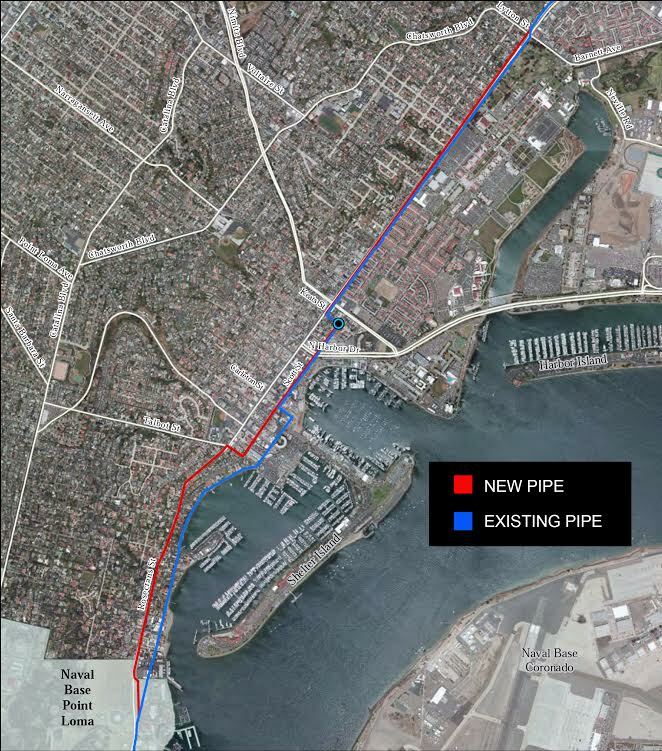 At Keats Street, it will return to Rosecrans and connect to existing pipe at Lytton Street. 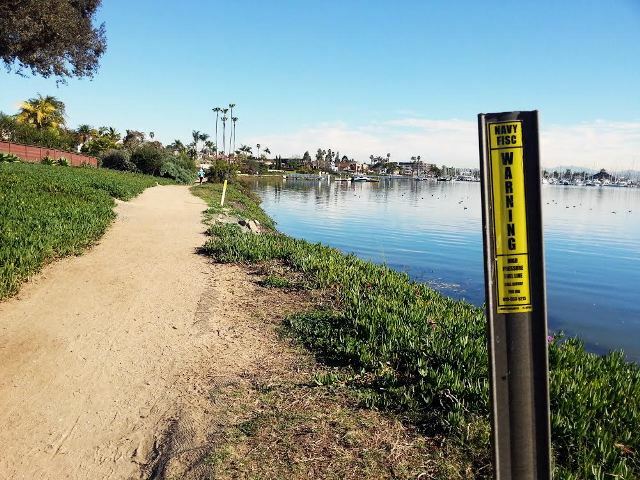 Existing pipe along the historic La Playa trail at Kellogg Beach will be relocated to Rosecrans. Environmental benefits will be gained as that pipe is removed and the shoreline reinforced and replanted with native species, Warner said. More new pipe will be installed along Rosecrans north of Kurtz Street and eventually cross the San Diego River attached to a bridge, replacing pipe that currently lies beneath the river bed, said Mychal Loomis, a traffic engineer for Kimley-Horn. The project also calls for seismic improvements and new pipe around Tecolote Canyon. If plans are approved by the Navy and San Diego City Council as envisioned, construction could begin as early as December, Warner said. Warner stressed access to residents and businesses would be preserved. He said construction crews would work outside peak hours and maintain two-way traffic at all times. For a pipeline designed to last only 30 years, its longevity could be characterized as something of a marvel. The Navy has been storing fuel in Point Loma since 1919, and built the pipeline in 1954 after the facility was expanded to 40 above- and below-ground tanks, making it the West Coast’s largest refueling facility, Warner said. The operation has not been without its problems. Leaky tanks were detected in 2000, triggering a massive project to replace them with the current configuration of 10 above-ground tanks. In the mid-90s, the pipe itself suffered four leaks resulting from a failure of the active cathodic protection system, a technology designed to prevent corrosion, Warner said. When first briefed about the project, Warner said he had concerns about the integrity of the pipeline which, at 61 years old, has lasted double its life expectancy. “The first question I asked was why not all 17 miles,” he said. He was shown convincing data that the pipeline is still going strong, he said, and the Navy is replacing the first five miles as a precaution. “I want to make this clear: while the integrity of the pipeline itself is not in question, the amount of metal loss in the five miles of pipe was enough for the Navy to make the decision to responsibly and proactively replace the pipeline and insert additional seismic measures,” he said. Data verifying the pipe’s integrity is gathered two ways, Warner said. An end-to-end, visual inspection tracing the pipeline’s footprint occurs every day. Every five years, internal surveys are conducted using flexible sensors known as “pigs” to course through the pipe, measure its shape and detect material defects using technologies known as magnetic flux leakage and ultrasonic testing. La Playa resident Jim Gilhooly is a regular at PCPB meetings and self-described “devil’s advocate” regarding the plan. He is a retired mechanical engineer who was a pipeline inspector for the American Petroleum Institute and other organizations for 40 years. He said the pipe contains 547 areas of metal loss and, because previous testing wasn’t recorded properly, it’s difficult to establish the rate of corrosion. Furthermore, the amount of pressure — 800 psi — has never been adjusted to account for the pipeline’s wear, Gilhooly said. The pipeline should be replaced in its entirety instead of “doing it piecemeal,” he said. “I roger his concerns,” said Warner, approached after the Midway meeting. Eventually all 17.3 miles will be replaced, but it’s not currently cost-effective given the amount of wear detected, he said. Gilhooly and Warner did agree the internal testing should occur more frequently than every five years. Warner said he has asked the Fleet Logistics Center to study going to a 30-month interval. But Gilhooly said the current industry standard is 12 months. Repairing that trail is fine, but what about all traffic? As the article states, Rosecrans is the busiest street around! Why did they have to pick that one?? Plus what about those repairs on Midway you guys reported a while back?? Not looking forward to this. The project on Midway Drive you’re referring to is called Pacific Beach Pipeline South and includes more than nine miles of new water and sewer mains. Construction is supposed to begin in October but they haven’t said what part of it they’re doing first. When the City Council signs off on the fuel pipeline project later this year, the hope is they’ll coordinate it as best they can with the Midway Drive construction. Like you, Midway Planning Board members are concerned about this. I’m all for this relocation of this pipeline, more importantly bringing it up to current standards. Yes it will create congestion in our area, especially down San Antonio which is already a narrow street. But I welcome it as a strong preventative measure. We are also on the schedule to put the utilities underground and that too will cause disruption. Mayor Faulkner has vowed to combine projects and only rip the streets up once. This seems like a perfect candidate to support his objective. Not only will we be ripping up the streets but they are narrow streets and the impact could be felt only once. Newer Article: Midway Community Planning Group Report: Sports Arena Black Angus to be demolished?